The public comment period for the KXLY Development SEPA Application ends tomorrow, June 19th, at 5:00pm. This comment period snuck up on us since there was no notification made directly to the neighborhood via mail or to the broader public via a posted sign on the property. There was apparently a notice placed in the Spokesman Review for those that read the public notice pages. Regardless of the lack of notification, you still have a chance to have your opinions on this project heard. We have collected all the development materials on one page for your to review. SNC also submitted comments during the agency review period that you can review as well. Some of the main topics of concern from our comments that remain to be fully answered is the true measure of traffic impacts from this development. Aside from specifically calling out the future grocery store, the developers use the more broad development category “Shopping Center” to measure their traffic impact, but we know that there are other high impact traffic generators included in the plan such as a drive-through restaurant. This would increase their traffic impact and as a result their mitigation fee to the City. One other area of remaining concern are the developer’s plans to manage stormwater on their site. Preliminary plans show them retaining the water in a large pond under the radio tower to the west of the development. There have been concerns about groundwater saturation from neighbors upstream of the KXLY site who already experience high water tables and occasional flooding in their neighborhoods. How will the City and developer certify that paving 80% of the project site will still allow for proper infiltration and movement of storm water for these existing residents? Whatever your views and concerns are, I encourage you to send an email to John Halsey, jhalsey@spokanecity.org, prior to the closing of the comment period tomorrow evening. The latest proposed design for the Ray Street Crossover. 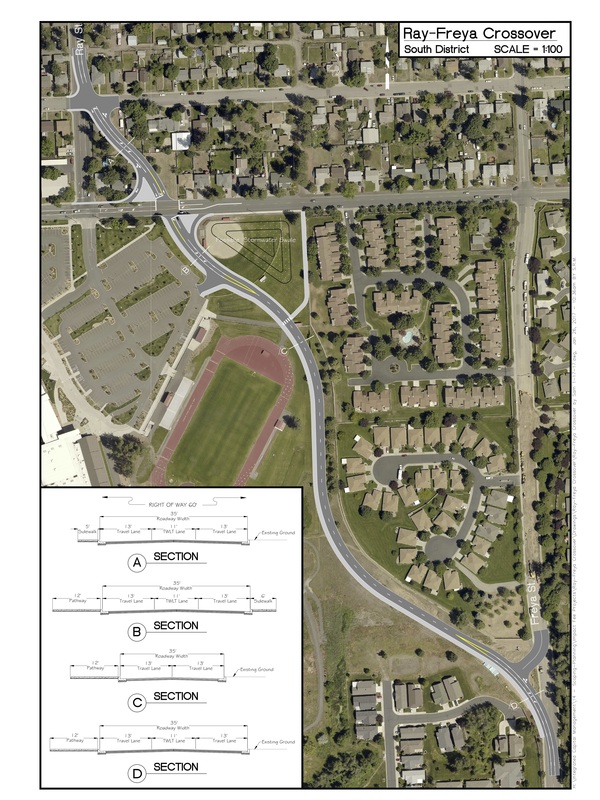 The crossover is a primarily auto-oriented route next to the campus of Ferris High School to speed access of vehicles from Ray Street to Freya Street and out to the Moran Prairie area. The crossover is shown on the arterial network on the draft Arterial Plan Map (Map TR12). This project has also been added to the 2017 DRAFT Capacity Improvement Project List referenced in Chapter 4 and found in Appendix D of Volume V (pg.41) of the new Comp Plan. The city is resurrecting this project as a way to reduce perceived vehicular congestion on Regal Street and funnel more traffic over to our neighborhood’s designated Major Arterial, Freya Street. The crossover concept isn’t new. It was last floated back in the early 2000s (and even earlier than that), but was abandoned during the Neighborhood Planning process that took place from 2007 to 2010 because data from the City could not show how this proposed crossover would improve level of service better than signalization improvements to the intersections of 37th and Ray and 37th and Freya. For this reason, and with the concurrence of the then-current Senior Traffic Planning engineer, the city-adopted Southgate Neighborhood Connectivity Plan does not include the Ray Street Crossover (see image below). 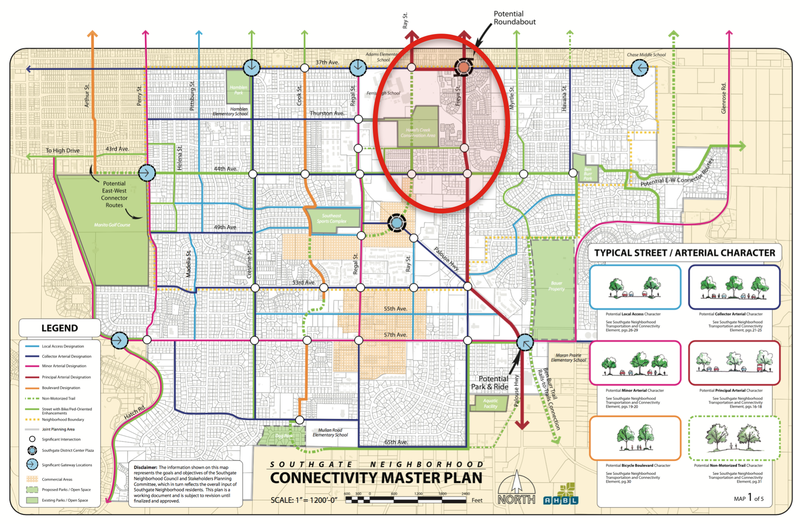 The neighborhood arterial map from the Southgate Connectivity Plan showing no crossover, but instead suggests intersection improvements only. Rather, the Neighborhood Plan suggests signalization improvements at the intersections of 37th and Ray and 37th and Freya to better manage the flow of vehicular traffic. This alternative reduces impacts on Ferris, on Hazel’s Creek and is undoubtedly less costly. The table below is taken from the 2017 Draft CIP List and shows the two signalized intersections are estimated to cost $500,000 where the crossover would cost $4,056,000 and still require a signal and intersection improvements at adjacent intersections. In addition to putting back in the Comp Plan, the City recently submitted a Roadway Capacity Justification (RCJ) report to the Spokane Regional Transportation Council (SRTC) in an attempt to justify the development of the Ray Street Crossover. The RCJ report ignores the Neighborhood Plan’s recommendations, that is the signal improvements at 37th/Ray and 37th/Freya, and instead just models traffic impacts with and without the crossover. City staff have told neighborhood representatives that they have the ability to run the transportation model in-house. We requested that this model be run and the RCJ report adjusted to reflect the neighborhood’s preferred solution. The aforementioned 2017 Draft CIP List does include signalization of 37th and Ray and 37th and Freya as projects in the South region (see below). and addition of a proposed minor collector between Southeast Boulevard and Crestline Street. It would help determine how these individual projects and designations align or do not align with the goals of the Southgate and South Hill Coalition Neighborhood Plans. It would help these or any other projects support the existing and proposed Comprehensive Plan’s call for a “Balanced Transportation Approach” that seeks to first accommodate the pedestrian and maintain or enhance the character of neighborhoods and livability for neighborhood residents. There will be additional hearings on the Comp Plan update at City Council in the next couple of months, so the public will have a chance to comment on this proposal again. We will also keep you updated if the City provides models for the intersections improvements called for in our neighborhood plan. Our Comp Plan and Municipal Code call for balanced, multi-modal translation development in our City, this proposal is geared primarily towards auto-users and a less dramatic, fiscally reduced solution should be considered before putting this into the Comp Plan for the next 20 years. The KXLY Development in the Southgate District Center has two different review deadlines coming up this week. On Wednesday, March 22nd the City’s Design Review Board will hold a “recommendation meeting” of the project at 5:30pm at City Hall where the developers will present their responses to the initial design review back in February. You can see the updated design here (warning: large 150MB file). The biggest changes are enhanced pedestrian connections between the development and the park, inclusion of infrastructure for STA’s new High Performance Transit stops along Regal, addition of a mid-block pedestrian crossing on Regal between the new development and the Target site, and better screening of the south side of the proposed grocery store. Feel free to take a look and send your comments in to Julie Neff at the City Planing Department. On Thursday, March 23rd the agency comment period for the KXLY project SEPA Application closes. The SEPA Application is where we can comment on issues like traffic impacts and stormwater management. The SEPA Application references a Traffic Operation Study submitted to the City in December that covers trip generation and Level of Service (LOS) for roads around Southgate before and after the project. The traffic study says the project will add 12,625 ADT to Regal Street bringing the total trips on that section of Regal up to 28,525 ADT when added together with existing trips from the City of Spokane Traffic Volume Map. That total doesn’t include trips generated by the new Maverik gas station or the proposed Regal Commons project. The SEPA application also covers potential stormwater impacts, so you can review that information as well. You can submit your comments on this SEPA Application to John Halsey at the City of Spokane Planning Department. This SEPA comment period is the agency comment period for this project. There will be another public comment period after the developer responds to the agency comments. Recent updates to the Spokane Municipal Code for neighborhood notification means that neighborhoods now get notified during the agency comment period instead of having to wait for the public comment period, but you can comment in both. Things are moving fast with the weather improving. Make yourself heard before it’s too late. Residents of the upper South Hill attended a Traffic Scoping Meeting last night held by the traffic engineer for the developer of the Regal Commons development along Regal Street. Attendees looking for answers as to the potential impact of the development and solutions to the current traffic issues on Regal were disappointed to learn the there was no real discussion of potential impacts discussed at the meeting. The developer’s engineer, Mr. Whipple, said that this meeting was to gather input from neighbors about areas that needed to be addressed by their traffic study and that results of their study would be presented to the neighborhood in a couple of months. The only real traffic impact data shared was old data from the developer’s SEPA application back in early June stating that the total buildout of the 8 acre site would result in about 3000 trips a day along Regal Street. As we have discussed in an earlier post, this number vastly under estimates the specific land use impacts of the proposed drive thru restaurants according to rates from the International Transportation Engineers (ITE) Trip Generation Manual. The ITE Manual is the standard reference and method used in Spokane to determine potential traffic impact of various types of projects. The developer’s SEPA application has been on hold since early August while Mr. Whipple develops new trip generation estimates using more appropriate land use codes for the proposed development. He argues that looking at individual land uses grossly exaggerates the actual number of trips per day which is why he elected to use the broader land use code he originally did. However, these trip generation rates are how the City and County determine the amount of mitigation to be paid for the impact of the development. I would hope that our municipalities would err on planning for the upper end of potential impact, our City planners seem to agree and have asked for revised estimates. We will share the new numbers once they are given to the City. There were a number of neighbors (myself included) that called for a broader comprehensive traffic study on the South Hill that looked not just at issues around Regal Street and 53rd, but looked at traffic patterns on and off the hill as well clear over to the Glenrose area. This is likely beyond the scope of this traffic study, but it is something area residents should pursue with the City and County to do in a coordinated and comprehensive way taking into account the full potential buildout of developable land in the City and out in the County’s Urban Growth Area. In addition to studying current traffic levels, the study needs to account for “background” projects. These are projects that have already been approved but may not have been fully built out. Mr. Whipple said that in this case that includes the Ben Burr Apartments currently under construction at Ben Burr Road and 57th Avenue, the 55th Avenue apartment complexes, and the “Swarthout” Strip Mall at 55th and Regal. We asked that his background data also include the nearly completed Palouse Trail Apartments behind Target, the KXLY and Maverick District Center properties (there were traffic estimates associated with their SEPA applications from 2008), and the Maverick gas station/Douglass property at 44th and Regal (this property had a 7000+ ADT traffic impact assigned to it during its 1997 SEPA process). All of these projects came with hundreds, if not thousands, of vehicle trips per day associated with them. Adding them all together places Regal Street well over capacity as a designated Minor Arterial. Other items to be considered in the traffic study is a sight distance analysis along Regal at 53rd and 55th and a “Mini-roundabout” at Freya and 57th (we’re looking for more info on that). Neighbors took the opportunity to discuss their perception of current traffic conditions along the Regal Street corridor and their experiences trying to commute along the street in recent years. KXLY News was on hand to record the event and posted a short story about it on their evening news. Suffice to say people are already experiencing extended commute times during peak traffic hours and many wanted to see Regal widened to accommodate more traffic. As has been said in the past, widening Regal is not an option since the City and County do not have the right-of-way available to put more lanes on the street. City traffic engineer Inga Note, who was in attendance, verified that fact and said there are no plans and no real way to widen Regal. It has been shown both nationally and around the world that widening roads only provides temporary relief to auto congestion. While no solutions were forthcoming at the traffic scoping meeting, the issue is now very apparent to the developer, the City, and the County. One possible mitigation proposed by the developer is to add a traffic light at 53rd and Regal. This will not reduce traffic, but could help manage its flow, especially into and out of the new development. However, the City Capital Improvement Plan does not have this project listed and the COS Transportation Impact Program report cited by Mr. Whipple that lists a traffic signal at 53rd and Regal has not be adopted by the City, so their mitigation funds cannot be used for that project. Additionally, City policy states that traffic signals need to be placed at the intersection of designated arterials. Regal is designated a Minor Arterial, but 53rd is not. Another detail for the City to work out with the developer. Finally, there were concerns from a few attendees about the non-auto users of the neighborhood roads. Bicyclists and pedestrians (including school kids) use Regal and adjoining roads as paths to school and businesses around Southgate. No one felt that Regal was a safe environment for these users. Mr. Whipple took the time to explain that existing conditions cannot be blamed on the proposed Regal Commons development. However, it should be incumbent upon him and the developer to make sure their project does not exacerbate these issues, especially since the zoning for their project is supposed to be pedestrian-oriented as described by both the City and County code. Overall, there were no solution offered at the meeting last night, and there was not a clear picture of the potential impacts given either. Southgate Neighborhood Council will continue to monitor the progress of the SEPA application and notify folks of any opportunities to give comment or learn more about the state of the development. If you have concerns and comments about this issue I encourage you to email the SEPA Application coordinator for this project, John Halsey at the City Planning Department. You can also send a note or CC our City Council representatives, Breean Beggs and Lori Kinnear. As always if you have questions for us you can email us as well. At our last Southgate Neighborhood Council meeting the developers of the KXLY property presented a concept site plan highlighting their project’s connection to the Southeast Sports Complex and its enactment of the intent of the Center and Corridor zoning and Integrated Site Plan. We’ve uploaded the full presentation here for people to look and review. Keep in mind a couple things: 1)These are just draft concepts and there have been no building permits applied for at this time. 2) The developer has not mentioned or listed any tenants of the buildings at this time. So any mention of a company or store is just illustrative. You can catch a news story about this on KXLY News tonight at 5pm and 6pm. Lastly, please make sure to comment on the proposed Comprehensive Plan Amendment for the small city-owned parcel between the park and KXLY’s property. Comments are due July 11th and you can see more information about the proposal on the City’s Planning Department website. The comments period is just about the zoning change and purchase of the small city-owned parcel, not the development as a whole. The full development will get its own design review and comment period when the developers submit building permits. This proposal is the first domino that as to fall before any major development actions take place. On Monday, April 11th, the City Council voted to approve the Spokane Housing ventures Annexation that has been under consideration for almost a year now. The action brings about 37 acres of new land between Regal and Freya Street into the Southgate Neighborhood. The Council further voted to bring the land into the neighborhood under the Center and Corridor land use category, which was the position of the neighborhood council since this time last year. As we mentioned at our March Neighborhood Council meeting, there was a lot of controversy surrounding the land use and zoning related to the former South Regal Lumber site. SNC had made the point that the City Comprehensive Plan and our Southgate Neighborhood Connectivity Plan supported the designation of this land as Center and Corridor rather then General Commercial land use and zoning. We are very happy to have the City Council support our viewpoint by a 6-1 margin, but more importantly we are happy to have the City Council support the City Comprehensive Plan and its goals and policies. The Spokesman-Review is reporting that the City is facing a threatened lawsuit from the developer for taking this action. I want to thank everyone that contacted the City Council regarding this issue. We were told that public input was a big part in the consideration of this issue over the past few months. I would also encourage you to contact your City Council members one last time to thank them for standing with the Comp Plan and the neighborhood to enact the vision so many people worked to create through our neighborhood planning process. We will keep everyone updated on any further action or outcomes from the annexation. This is one case where it paid to get informed and stay involved. I look forward to seeing everyone at our future Neighborhood Council meetings where we will continue to discuss issues related to the safety and quality of life for Southgate residents.